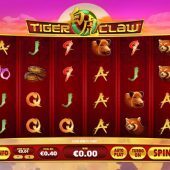 Tiger Claw slot will undoubtedly be popular due to the various other slots it's based around, Raging Rhino and Buffalo Blitz which are popular amongst the high-variance slot fans. That said we could also criticize a lack of imagination here as like Microgaming they tend to 'clone' existing games (i.e. use the same model and re-skin the graphics) in order to make cheap additions to their slots catalogue. Visually it's pretty basic with red reels and a simple jungle sunset background and of course we get some atmospheric music from the region as we play. 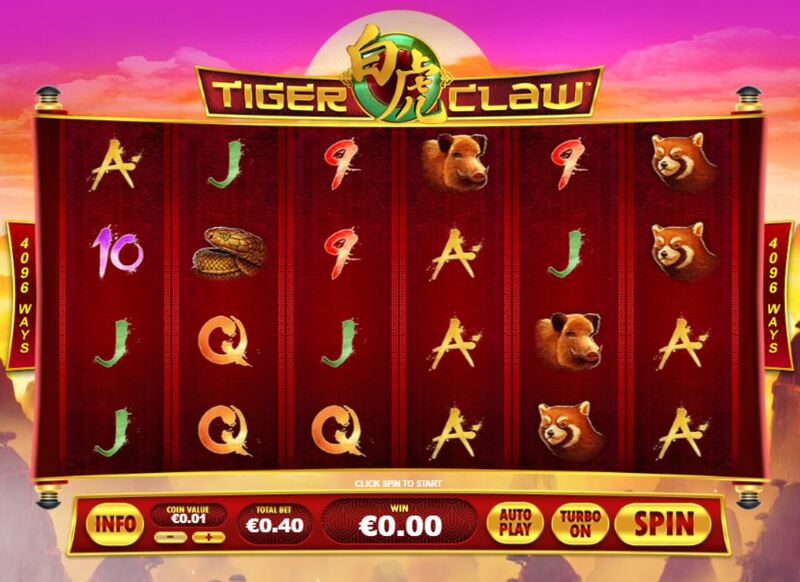 By the way, it's not to be mistaken with the very similar named Betsoft slot game Tiger's Claw. So, will we be able to claw back some of our bankroll from this tiger? As with the games mentioned above we get 4096-ways over 6 reels of 4 rows each. The icons are stacked and we see the familiar card values of 9 through Ace in keeping with the model paying 150, 120 or 100 coins respectively for a full way of 6 symbols and we pay 40 coins to play. You'll be more interested in the animal icons though as firstly they seem to be from different continents which is unusual and secondly the highest-paying Tiger (7.5x bet for all 6) appears to be a Siberian one more in keeping with IGT's Siberian Storm than the jungle! We then see a Red Panda and Ibex paying 250 coins with finally a Warthog and Snake for 200 coins in this eclectic mix of wildlife! At least the Buffalo on Playtech's other version would recognize his fellow animals. One of the two small differences between Tiger Claw and Raging Rhino is the fact that the single Chinese Character Wilds appear not just on the centre 4 reels but reel 6 as well and the symbol stacks here can fill all 4 rows sometimes instead of just the 3 on that game. This means it's theoretically possible to get base game hits in the tens-of-thousands times stake range. I said 'theoretically'. If you see 3 or more 'Tiger Free Games' scatters then 8 spins are yours, 100 free spins if landing all six! You also receive 5 extra spins for 2 in view during the bonus as well as standard retriggers. Your enhancement here is that the Wilds award random 2, 3 or 5x multipliers to any wins they form part of but unlike Rhino they don't multiply each other, just add so a 25x multiplier is the best you can get unlike Rhino's 81x but remember here you can see 4-high rows. It's possible to see wins in excess of 30,00x bet in the free games but again don't make the mistake of playing this slot and expecting them, because as with Playtech's Great Blue the maximum hits ever recorded will undoubtedly fall far, far short of the theoretical maximum potential.